They may be a virtual death metal band, but Dethklok tears at the very fabric of the universe with Dethalbum III, their third full length release. The band is featured on the Adult Swim animated series Metalocalpyse, but the real group behind the animated characters has toured with some pretty serious metal heavyweights. In 2009, Dethklok toured with Mastodon, High on Fire and Converge. And a 2012 tour was planned with Gojira and Lamb of God, but Randy Blythe’s bail hearings in the Czech Republic put a stop to that. Dethklok is the creation of Brandon Small and Tommy Blacha. The animated band is led by vocalist Nathan Explosion and features Skwisgaar Skwigelf (lead guitars), Toki Wartooth (rhythm guitars), William Murderface (bass guitars), and Pickles (drums). The “live” band is Small (vocals and guitars), Gene Hoglan (drums) and touring bassist Bryan Beller. Regardless of construct, Dethalbum III is a damn good death metal album. It is innovative, loud and nasty. It’s also a recording that can be taken seriously from a technical standpoint – a rare thing in this world of gimmicks. The songs benefit greatly from Hoglan, whose career has featured work with bands like Dark Angel, Death, Strapping Young Lad, Testament, Opeth, and Fear Factory. He also played on Dethklok’s previous two releases. For his part, Small is not only a creative guitar player but a pretty damn good death metal vocalist. He never sounds like he’s merely emulating and the songs, built as they are from some suitably ridiculous places, take on consequence and scope under his leadership. “I Ejaculate Fire” kicks off Dethalbum III with waves of frenetic guitar and Hoglan’s flurry of hammers and cymbals. Small’s low growths are well-textured but explosive and his careening fretwork makes the track an ideal candidate for Guitar Hero. Careful for the blowback. The blistering “Crush the Industry” is another highlight. It features more innovative work from Hoglan and some keyboards for colour. After an extensive intro, the track clears for wicked twin guitars and a neat vocal layering trick that fills the speakers with demonic growling. Other tracks, like the relentlessly fun “Impeach God” and dark and winding “Andromeda,” layer Dethalbum III with intensity and hellfire. And “The Galaxy” swings the doors open for melodic possibilities, with Small’s songcraft emerging as a well-tuned and well-considered animal from Other Side. 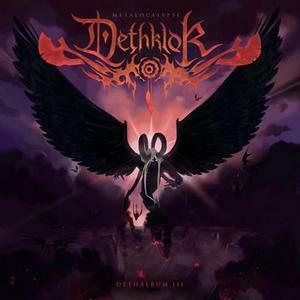 The ignorant may clock Dethalbum III as a cheesy cartoon soundtrack recording and dismiss it out of the gate, but those with sophisticated tastes will recognize indeed that “This Mess is a Place.” Simply put: Dethklok roks.